Hi friends! 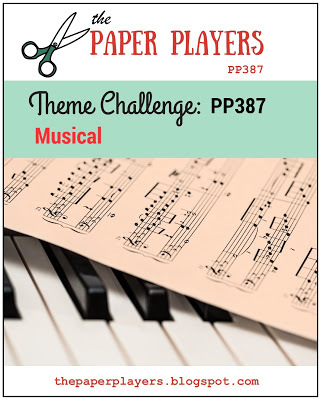 It's Sunday and that means time for a new challenge at The Paper Players. This week the sweet and talented Laurie is our hostess with a theme challenge: Musical. I love this challenge and knew just what I wanted to do with it! My eldest son is a music-loving city dweller. His birthday is in a few days, and this card is for him. In the summer, almost all of the restaurants where he lives have outdoor tables and live music, and I tried to capture a little of that. I gave my hipster-musician-dog a city background, and followed up on the music theme with an embossed background. I had a lot of fun making this card, and I hope I accomplished the Brooklyn vibe I was going for! The inspiration for my layout came from the sketch challenge at CAS(E) this Sketch! The circle element was just the right size for my little scene. Oh, this is so cute! I love your textured background and your fun take on the sketch! Sandy... cute, cute cute! 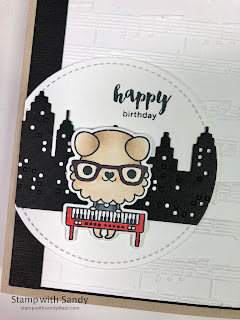 And I love the embossing folder! LOVE this Sandy! 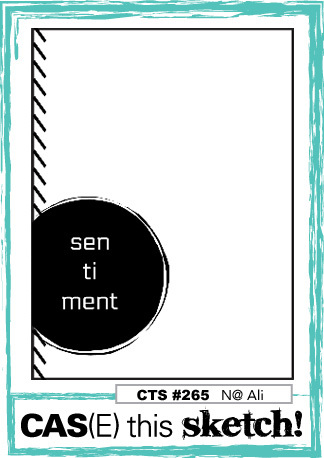 Really cute image and background...perfect card for your son for sure. Happy Easter! Sandy, I love your hipster music scene and the story that goes with it. Love the cityscape in the background - it looks great. I hope you've had a lovely Easter. Sandy this little dude is so cute! 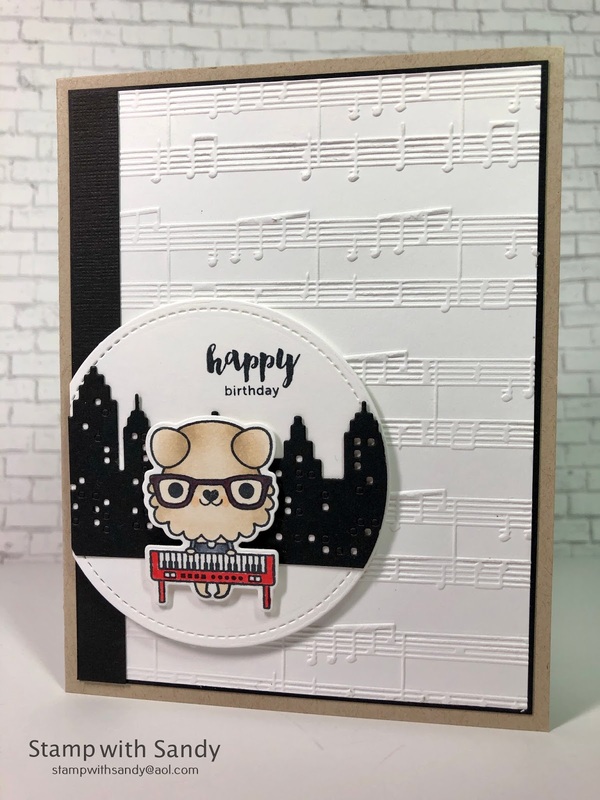 Love that musical embossing folder too - I definitely need to source me one of these! 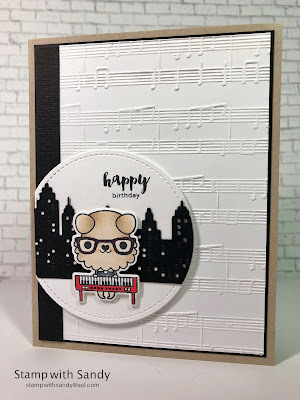 A fab card for this week's challenge. Easter greetings to you! This just cracks me up! First, the embossed background is amazing! Second, your coloring is amazing! Third, that little hipster dude is amazing! Such a fun image and I know your son will love this!!! 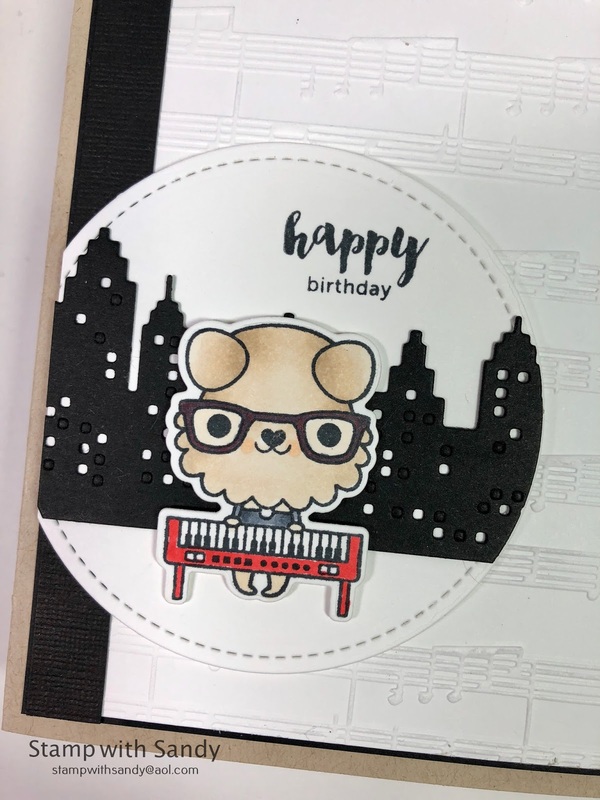 Very cute way to use that sketch too! Such a fun take on the sketch! I'm sure your son loved this card!